Charlotte’s Web is one of the largest and most established CBD sellers in the United States. Media coverage of their efforts to help a young child suffering from severe seizure disorders led to widespread popularity and awareness. Charlotte’s Web is now a publicly-traded company in Canada, boasting a wide range of CBD oils, creams, capsules, and pet products. An enormous marketing budget has made them the most recognizable brand in the CBD industry, and their variety of full-spectrum and isolate products can be found at retail locations in a dozen states. The company is vertically integrated, using their own plant strains and externally-sourced hemp oil in their product lines. Charlotte’s Web has received warning letters from the FDA as a result of impermissible health claims, which have since been resolved. 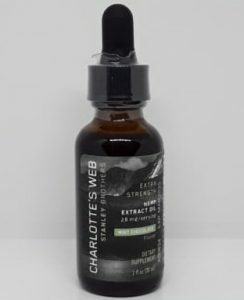 The Charlotte’s Web Extra Strength is their premium full-spectrum cannabidiol oil. Charlotte’s Web is owned by Stanley Brother Holdings, a Colorado company publicly traded on the Canadian Stock Exchange.